If there is no God, any arguments against the Bible are mute! Why are you so angry and envious of Christians? Is it because Christianity has led to your freedom to speak that way? The word you were looking for is 'moot', not 'mute'. Get an education. rational secularism is what gave us rights such as speech, association and press. The Bible did its level best to supress every single one. For centuries the vatican tried to control education, ensuring everyone but their priests was illiterate. The Vatican not CHRIST ohhh I forgot how man can manipulate something for his personal interests. There IS A GOD, and every prson will meet Him when they die, wanna take your chances???? You said, "There IS A GOD, and every prson will meet Him when they die, wanna take your chances????" So you believe just to hedge your bets? Do you really think that an all-knowing god will be fooled by your little ruse? You may also want to look into all other religions. There have been some pretty vicious gods invented by man. Most don't look favorable upon people not believing in them. Better make sure to get on their good side, too. The bible says you can stone your children as well. Who cares what is said in a book of myths from the bronze age. Lets all grow up and build the just city together for all of us to live a better life! Face facts. Most kids deserve it. And so do their parents for having them before the age of 20. Idiots. If you believe God created us (I do) then He made us to work in a specific and beauitiful way. If you mess with that natural process, your asking for trouble... and look! we've got trouble! Leviticus 20:13 Amplified If a man lies with a male as if he were a woman,both men have committed an offense(something perverse,unnatural,abhorrent,and detestable);they shall surely be put to death;their blood shall be upon them. leviticus 20:19 For every child that curseth his father or his mother shall be surely put to death. Please read the rest of Leviticus. It is absolutely crazy. You apparently did not read the article. The bible has been translated several times...incorrectly. This scholarly priest is attempting to clarify meanings that people have added to the bible. 10% of all mammals and birds are gay. Why? If they weren't their populations would explode. Evolutionists can find no mechanical cause and effect explanation for this. Absence such secular proof, God becomes the default explanation. I can think of another source besides God for this reason, but I won't get into it here. When you are so far to the right you make mussolini look like a moderate, centrist news agencies DO seem leftist. But thats your problem, not the media. The bible and religion on a whole are ways of controlling people. To me the bible is a nice tale. I hate to inform you, but there are millions of democrats, socialists, etc. that do claim to be Christian (like myself). I believe that republicans are on a path to hell with their beliefs in being self-serving, not helping the poor, being racist/judgemental, and threatening violence for anyone that does not believe the way they do. Jesus did not approve of the "ultra religious" and self-serving people that used the church/God for their own gain. Please refer to the bible for any other questions or concerns. The passages in Isaiah, Jeremiah and Ezekiel are actually about Israel. And that is just for starters on this article. I know what the goddamn bible says. No one wants to read that garbage. your upset because you know its right. The Word of God is Perfect, Infallible and Absolute Truth. It is the light in darkness. It is the final authority of ALL creation. God's Wisdom exceeds that of man's foolishness. Therefore, no, I'd rather have the Wisdom and Understanding of God compared to man's foolishness any day. So you're a bigot and incapable of thinking for yourself...kudos little one...time to grow up and leave your imaginary friend behind. 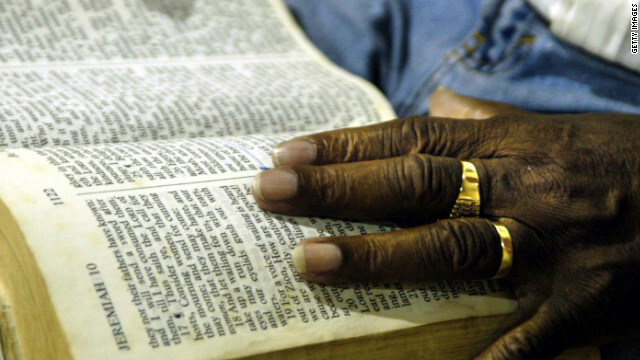 What makes the Bible infallible? you make a lot of claims, but do not support one of them. I can accept that you believe the word of "God" is infallible. OK, Let's say we give you that. The real question is that all the books of the Bible – and even saying "the" Bible is incorrect, because there are at least hundreds of different versions – were written by hundreds of human beings, who absolutely are, without question, fallible. How can you know for certain that mistakes were not made? How can you know for certain that some of the writers didn't have hidden motives or agendas? How do you know why certain rulers throughout history decided to include some Christian texts in the Bible while leaving out others that are just as legitimate? The problem is that there is no such thing as the "Bible." The stories that make up the book you refer to were written by humans, edited by humans, and translated by humans. I believe that God gave me the ability to think for myself, and when something doesn't make any sense, I question it. I believe that God would want it this way. TRUTHPREVAILES gives the perfect example of two people, one wanting to direct their lives under God and the other directing their lives under Man. Look how they talk (write), one explains how he wants to believe never giving an example of his belief's, the other (man worshiper) showing exactly what he believes even going as far as to demean and criticize the god worshipper of his belief's. Boy would this earth be a lot better if all man worshippers just disappeared off the face of this planet. @truthfulster@gmail.com: Better to believe in something that can be proven to exist (ie; man), than something that can't be (ie; god). The belief is damaging if it impedes on equal rights. We belive what we live, it's impossible to understand with the mind the matters of the spirit, I prefer to "evolve" into a more spiritual being rater into a more recional one, but well that is just me. The earth will be a better place when every person turn their hearts to God. If you are incapable of forming an opinion on this without the use of the buybull, then you are incapable of free thought. The APA has done numerous studies on this that are updated within the last 20 years, not 2000 years (the last time the buybull was updated). You can opt to live in the 21st century or stay stuck 2 millenniums back but you will not change the fact that being gay is natural and you will not change the fact that the world will move forward regardless of your bigoted views. You want respect and the ability to speak freely, then do the right moral thing and give that respect to everyone. If your child turned to you today and wanted to introduce you to his/her same gender partner, would you disown them or would you be open to them? All anyone wants in this world is equal rights and regardless of belief, se.xual orientation, color or disbelief...everyone deserves the same rights. It really is time, the buybull was left out of decisions of such a controversial issue and time people started to live in the 21st century. I choose to belive what the Bible says as well, don't mind if any one thinks I am uncapable of "thinking by myself", my choice, my life, what would I want to think like you for example? Are you offering me eternal life as well? Anything to offer at all??? Sure, I'll offer you eternal life. In fact, I'll offer you and your entire family eternal life. Does offering you a better deal make what I say more accurate? @Gfrce: You failed to see the questions asked. If your belief impedes on the basic rights of others, then it is wrong. Your god does not exist to the best of any SCIENTIFIC STUDY and regardless of how braindead you wish to remain, science will always trump your delusion. I sometimes think that, if we first taught our children these simple guidelines, any religion or other supernatural belief would be quickly dismissed by them as quaint nostalgia from a bygone era. I hope we get there as a species. If being Gay is a sin, How come so many christians have gay children? Riddle me that one Batman?!?!?! @IEH: Punished for what? Being born that way? The "PARENTS" are being punished NUMB-nuts. Read your own question. The problem with your statement is that science endeavors to prove itself wrong thereby discovering the truth. Religion requires ignorance and adherence to doctrine and alleged "truths" without question. Can you provide names of scientists and their published statements for the claims you make? Yep, and the bible has been proven wrong for centuries. And everyday science proves even more of it wrong. Thanks for bringing that up! Yes except when the Bible is wrong (and it is wrong about a great many things) it can't change to include the newly discovered information. Only science can be updated in this way. "few decades ago they only believed.there was one galaxy ours "
Please do tell what scientist(s) believes this. The problem with sience is that it is half true and half fairy tale, no one can prove the Big Bang for example, it is a bunch of half trues, evolution? How come no animal has evolvedb in the last 3,000 years? Weird, "science" IS THE RELIGION of many of the people writing here, beleiving a bounch of "science dogmas", the bad thing is that they cannot prove this, so I will choose to follow the path to God. I do not believe in "science" when it comes to BIG themes such as creation and evolution. @Gfrce: Can you provide evidence that your god exists? The fact that you depend on a book written 2000 years ago for your guidance in this world, proves that you are incapable of thinking for yourself. Imaginary friends are meant to be left behind with your childhood. I'm not sure why your parents are not supervising your internet usage since you do have have the intellect to be on here by yourself. Science doesn't provide answers to creation. The Big Bang or Standard Cosmological Model is just that...a model.. just like a weather map is a model used to predict the weather. It accurately describes the motions of galaxies in the universe to make predictions about the past and future states of the cosmos. Your grasp of science is pitiful and so you have no business making observations about it. I have my own opinion, my brain tells me to follow The Bible, my heart as well, I choose to depend on a book written 6,000 years ago (not 2,000), It has changed my life, so, that is the only proof I need, I need no science to tell me it's truth, I have my own, I have experienced peace from the inside out, I love the stars and the Universe and my theory is that the Big Bang is true, it matches with the biblical descrption of the Creation of the Universe, so then maybe sience will find Godbas well. Peace to all of you. Remember what the author of this article said. "This is my take" It doesn't mean its right. Isaiah 5;18 "Woe to those who drag their sins behind them like a bullock (fn. ' with cords of falsehood') on a rope"
Agreed! A man's ways is right in his own eyes. "A man's ways are right in his eyes"
You two dimwits are doing exactly the same thing. The only difference is he's got logic, reason, historical context and extensive study on his side, while you two have your faith in the very narrow interpretation of the bible you were told is the only interpretation (I can only assume you were taught this as children, thus you accept it as ancient and unshakable fact). He wins. @BamaDanial Maybe if you typed in proper English and punctuation I could understand what you are going on about. Also, what were you trying to say about languages? While Aramaic was the common spoken language, Koine Greek was the language of commerce and the language that most of the New Testament was written in. Name them .joxer I speak American yes NT was translated to Greek years ago Paul was a Roman I doubt he originally wrote in Greek . BamaDaniel, when did you choose to be heterose.xual? Mallard Ducks, American Bison, Bonobo, Bottlenose Dolphins just to name a few. American is not a language by the way. Most of the new testament was written in Greek, not translated. Paul being a Roman means he would be most likely to either have his letters written in either Latin or Greek and since Greek was the more dominant language in area around Israel, his letters were more likely to have been written in Greek. You need to research things before you post. None. The gay community was hoping for a couple of penguins but it didn't pan out. Fetuses aren't babies anymore than eggs are chickens. And your God was responsible for many infant deaths...heck he even commanded it by having all the first born males of Egypt marked for death. And proved his incompetence by missing Moses. @BamaDaniel: Did you make it past grade 3? It's funny how this so called researcher totally missed the second chapter of Genesis where it CLEARLY talks of what God created and the purpose of why he created a woman to be a man's mate NOT a man and a man or a woman or a woman. PLEASE, if you have so much to say about the Bible, you should be smart enough to read it! You have to be a fool to take this fairy tale seriously in the first place. This is the 21st century. Wake up and smell the coffee. This is the very reason why there should be a separation of state and religion. You are now assuming that every individual in this country is a Christian or believes in the Bible. @Trice: We know about the buybull and dismiss it as the fairy tales it is. The fact that you wish to quote it is only proof of your inability to think for yourself. BamaDaniel@ So what? We know the Jewish people are real, but it doesn't automatically make everything in the Bible true. What kind of moronic logic are you using? The bible is a fairy tail – myths and nothing more. Its nonsense! Grow up! Do you seriously believe this nonsense? The whole Adam and Eve story is nothing more than a romanticized fairytale. If you literally believe that the first woman was "magically" created by a single rib from a man then you must also be naive enough to believe in the tooth-fairy and Santa Claus. Learn some critical thinking and basic biology instead of blindly accepting ancient fairytales as truths. The copper mine has a rather wide range of possible dates. And archeologists have NOT said that it MUST be of King Solomon's days. That's just selective reading on your part. There is no firm record of Solomon's days, so dating the mine to a particular period would STILL not tell you it was Solomon's. Your brain has played a trick on a very gullible YOU.